2,000 feet, 2,000 people, 4 hours of hiking. The most impossible screening of #MissionImpossible Fallout. Tom Cruise just cannot do anything sane, can he? A week after he dropped the action-packed climax of Mission Impossible: Fallout where he chased Henry Cavill in a chopper through tricky terrain, he’s gone a step further. At one point during that climax, Cruise is dangling from a cliff that happens to be Norway’s Pulpit Rock. 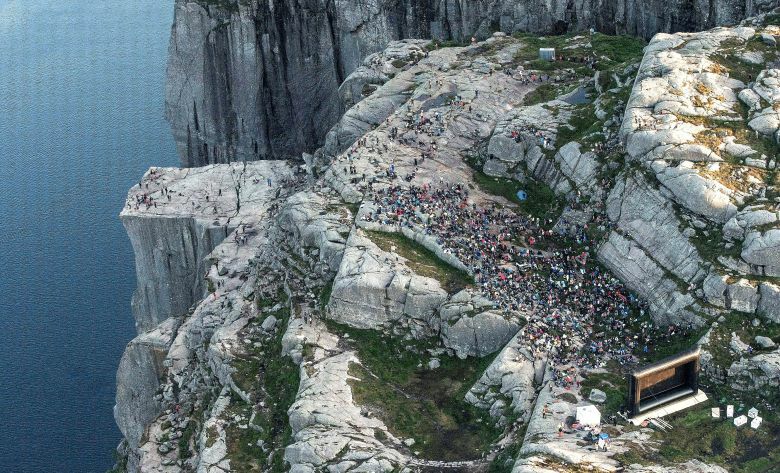 After the film’s blockbuster success around the world, the studio went back and organised a screening on the same cliff. Cruise is known for his generous gestures towards his host countries. He went out of his way to promote Dubai tourism as a ‘thank you’ for their co-operation during Mission Impossible: Ghost Protocol, which has a key sequence at the Burj Khalifa. The climax of Mission Impossible: Fallout alternates between New Zealand (where the chopper and scenes of pursuit were filmed) and Norway (that showcases the final face off between Cruise and Cavill, trying to climb the rocky cliff). Looking at the above pictures, we all wish we could be there.